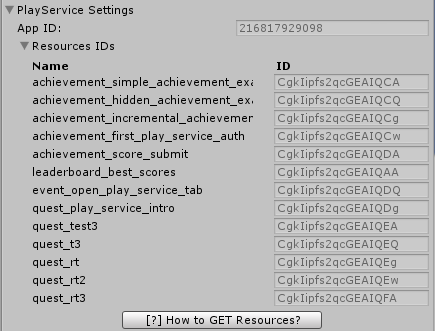 Other Resources' IDs, such as Leaderboards, Achievements, Quests. How to properly add, edit and remove this resources will be described below. 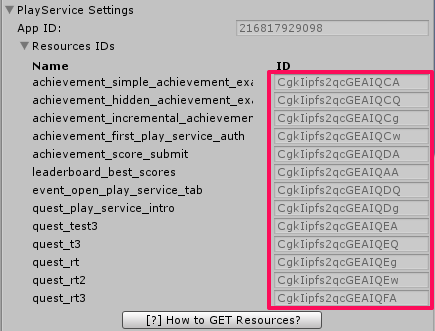 So, by editing this file you can edit Play Service Resources names and IDs. If you have no such file in your Unity Project, you should create one (anyway, warning in Inspector window will be displayed). At the very begining this file is empty. You have to add new rosurces to it. 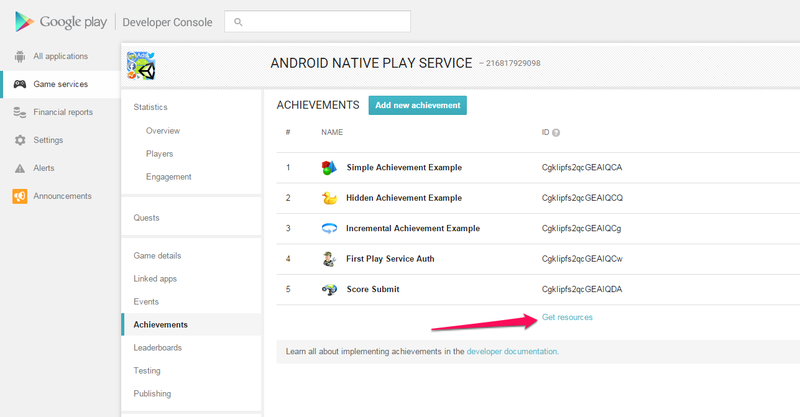 You can get resources of your application for Google Play Service in Google Play Console. Open your Google Play Console, select application, select Game services and select any of bottom sections (on the screenshot below Achievement section is selected). To get all resources for your app, click on Get resources link as shown above. That's what you need! 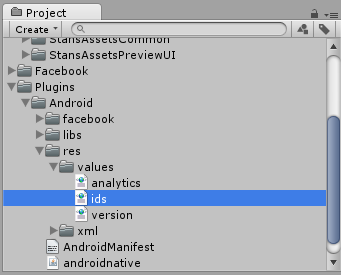 Just copy this XML content and paste it to ids.xml file inside your Unity project. 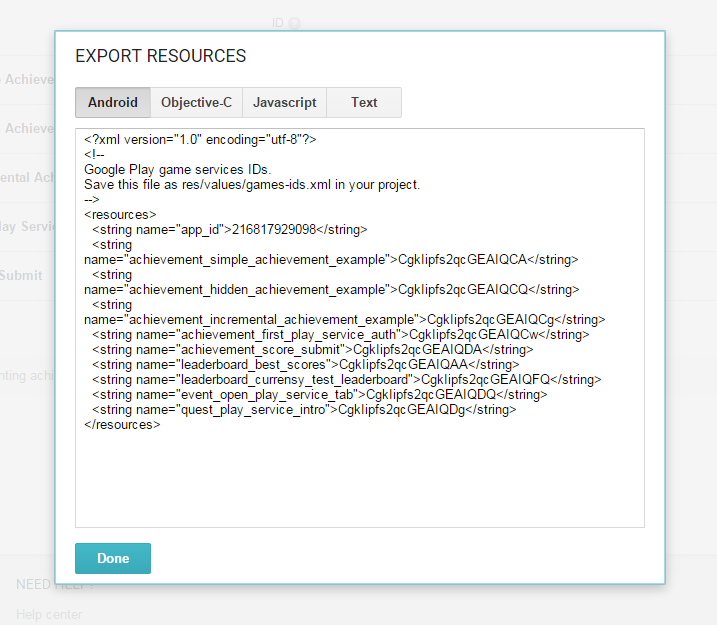 If you are updating Google Play Service resources in your Google Play Console, don't forget to update them in your Unity project ids.xml file. Can I use this plugin with other Android Plugins? Can I cut plugin functionality? I prefer to use another billing plugin. 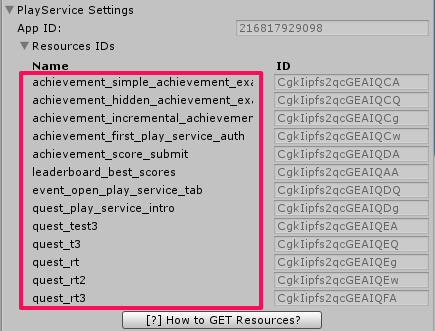 Achievement / Leaderboards Cache update. In-App Billing Version 3 refunds. Any of plugin functions is not working. Copyright © Union Assets 2014-2019 All rights reserved.